Without being large enough to reveal a dining trend, Pleasant Ridge offers a festive hodgepodge of places to grab a bite. Emanu East African restaurant is a trendy-but-unpretentious spot to laugh with friends around a spread of Ethiopian Injera flatbread covered with delicious East African dishes. A thousand years of tradition involves sharing the meal with your companions by ripping off a piece of the crepe-like bread and using it to scoop from the communal spread. This can be wonderfully bonding – or comical, depending on who you invite to dinner. 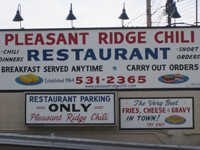 At the other end of the dining spectrum is Pleasant Ridge Chili, which some connoisseurs consider the best Cincinnati-style chili in existence, but where the specialty of the house is fries with cheese and gravy, which defy both description and the intensity of contentment they deliver. Rocky's Barbecue Hut smolders away with hot ribs, and The Loving Café specializes in vegetarian fare. As you head down Ridge Rd. towards the expressway there is also a competent variety of fast food places to snag a quick bite. There's an ample supply of libation and live music at night in Pleasant Ridge. 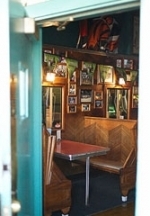 Molly Malone's is the place to catch lively Celtic reel with your Guinness and grub. On Saturday nights the Pleasant Perk jitters with rock. If you like your music a little more to your personal taste, whatever it may be, it's hard to stump the jukebox at the Gas Light for a popular song to eat a burger by or throw darts to. And if you just want to catch your breath with your brew, The Pleasant Hour is noted as offering the most laid back happy hour in town.